You’ve probably heard about 3D printing, and you’ve probably thought about 3D printed miniatures or terrain, but you probably don’t own a 3D printer. What to do? You’ve got roughly four options, which I’ll describe here from the easiest (and most expensive) to the cheapest. If you have no files and nothing to start with, just an idea, head over to HeroForge. Their site includes an incredibly customizable mini creation tool that works right in your browser. Choose from a huge variety of body types and measurements, clothes, items, helmets, boots, and so forth. They’ll then 3D print it in materials ranging from nylon plastic (USD $15) to steel ($35) and ship it directly to you. They can’t do terrain or anything beyond the minis you can build there, but what a great resource! If you’re looking for a bit more flexibility, Shapeways has a section of pre-generated character models (and many, many other models, too). You choose a model on the site, and they’ll 3D print and ship it to you. They have a relatively limited range of models, unfortunately, and you can’t customize them, but you can find minis or terrain that you just can’t build with HeroForge. But Shapeways is far from the only site offering mini files. 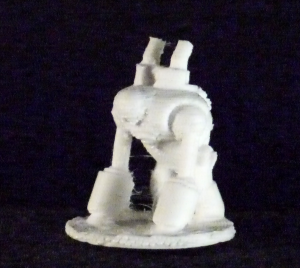 You can search online for a 3D model of your character, using sites like Thingiverse and Yeggi. You can then upload that to Shapeways for printing, or try one of the options below. 3D Hubs will connect you with someone near you who owns a 3D printer. You can treat this in basically one of two ways: You can just upload a file you’ve found online, use the service to match you with a local 3D printer owner, and treat the rest of the transaction like it’s any other commercial site: order your file and have it sent to you. Or, you can treat it as more like a local social network that connects 3D printer owners with folks who want things printed. You can communicate with the owner about the file you want printed, explain exactly what you want, and even meet up with him or her at a public place to pick up your printed object. You can build a longer-term relationship with that owner and have a bunch of things printed, with a lot more flexibility and options than you’d get if you’re just making an order on Shapeways. But the ultimate flexibility comes from a local makerspace or hackerspace. You might have one very close to you (search for a local makerspace here), and most of them have 3D printers. Members will almost certainly be willing to help you 3D print your object, and teach you how to operate their 3D printers yourself, so you can print as many objects as you want. Some makerspaces even sponsor 3D printer build clubs, so you can build your own 3D printer.